Baby Bliss with Jordan & Chris: Reduce. Reuse. Recycle. I am passionate about recycling. I have always done my best to 'reduce, reuse and recycle' but I've realized that it's possible to do more than just fill the curbside blue box. Now that we have a garage I have been able to create a pretty impressive (if I do say so myself) recycling system and am on a mission to make my life a little greener. Thanks to the folks behind Pacific Mobile Depots, I have learned that it is possible to recycle nearly everything. On the third Saturday of every month, Pacific Mobile Depots sets up shop from nine til noon in the parking lot of the Presentation House on 3rd and Chesterfield. 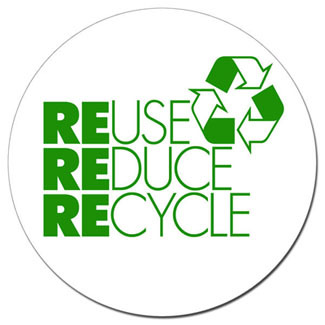 With bins to recycle everything from Styrofoam to hard plastic, milk cartons to foil-lined bags and more, it is a relief to know that things that otherwise sit in a landfill for hundreds of years will be disposed of properly. I love recycling depot days and truly feel like I am doing my part by emptying my sorted coffee cups, tetra packs, chip bags and take-out containers into their respective bins. Check out this extensive list of their accepted materials. Chris laughs and my friends think my recycling vigilance is a little crazy, but don't you think that if we all tried a bit harder it would make a difference? With a little time and more awareness it is possible to significantly reduce the amount we send to the landfill. We are a consumer culture obsessed with convenience and it's time for us to take a good look at what we're consuming and the negative impact it has on our earth. Plastic everything, packaged foods, and single use items, how often do we bother to think of the energy and resources required to make these 'convenience products' and how much waste they produce. Remember the movie Wall-E? Yes it's an animated film for children, but there is so much truth in the message and as Wall-E showed us, the result of over-consuming and laziness is a pretty terrifying reality. I promise to step off my soapbox now, but just one more thing: do you really need two paper cups, a java jacket and a straw for your latte?